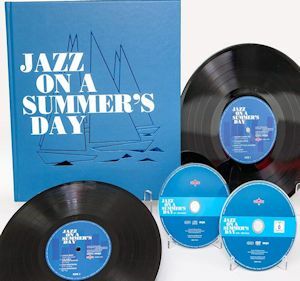 Extras include an interview with Bert Stern, an introduction to Jazz On A Summer’s Day, a snippet of the Chico Hamilton Quintet (with Eric Dolphy) in rehearsal, artist biographies and a photo gallery. The material on the CD is also presented on two top quality 10” LPs. This deluxe box set from Charly is a real box of delights, reminding many of us – and no doubt introducing a few others – to Bert Stern’s film of some of performances at the Newport Jazz Festival of 1958, a valuable document, even if it as much concerned with the larger atmosphere of the festival as with the individual performers. The film itself (in newly restored version) appears on a DVD; there’s a CD (remastered) that differs slightly in musical content; and also two top quality vinyl LPs (10”) of the same material that is included on the CD. The whole (it also contains a 40-page illustrated book, with notes by Fred Dellar) is a musical treat of the highest order. Jazz lovers (like me) of an older generation will doubtless (like me) be familiar, to one degree or another, with the film and most will surely have some happy memories of it. Mine have always included the opening music by the Jimmy Giuffre trio (Giuffre on tenor Sax, with trombonist Bob Brookmeyer and guitarist Jim Hall) – a deliciously witty model of contrapuntal jazz; Anita O’Day’s vibrant performance of ‘Sweet Georgia Brown’, followed by a crazily fast, but enjoyable, reading of ‘Tea for Two’; she is accompanied by her then husband, drummer John Poole, pianist Jimmy Jones and bassist Whitley Mitchell. The Armstrong tracks, variously featuring Trummy Young, Peanuts Hucko, Jack Teagarden and Bobby Hackett are richly enjoyable too. The proceedings are brought to a close by the wonderful Mahalia Jackson, singing her heart out in what was one of her first ever performances in front of a secular audience. Stern had hitherto been known as a photographer (he took famous photographs of Audrey Hepburn, Marilyn Monroe, Brigette Bardot, Catherine Deneuve, Sophia Loren, Elizabeth Taylor, Marlon Brando, Woody Allen and many others) and this was the first and only film he ever directed. He filmed on only two of the Festival’s four days – then “edited down 130,000 feet of film to just 8,000 feet” according to Dellar. Among those performing at that year’s Newport Festival who went unfilmed were Duke Ellington, Miles Davis, John Coltrane, Ray Charles and Dave Brubeck. But it would be miserably mean-spirited to place emphasis on what is not here, rather than enjoying and celebrating what is. There might be grounds for quibbling with the amount of time Stern gives to footage of the yachts sailing nearby. The one occasion on which I find this irritating is during the performance of ‘Blue Monk’ by The Thelonious Monk trio (pianist Monk with bassist Henry Grimes and drummer Roy Haynes). Perhaps Stern thought that Monk’s music would perplex a non-specialist audience. From other surviving evidence and my solitary experience of Monk performing live, Monk himself was as much a visual phenomenon as a musical one, with his bear-like dances, his shuffling at the piano and his quizzical stares. I would have liked to see more of this, rather than the somewhat distracting images (even if beautiful in their own way) of yachts sailing. Other caveats? Well the shots of a student Trad band, Eli’s Chosen Six, contribute almost nothing of musical value (though it is interesting to learn that the band’s trombonist was the late Roswell Rudd, then about to become a major figure in the jazz avant-garde. And the presence of Chuck Berry will interest only those whose interest in R & B is particularly strong. On the other hand, only an extreme jazz-purist, surely, would object to the presence of the of Big Maybelle? But these ‘negatives’ are far outweighed by the joy one gets from seeing (and hearing) performances by a host of significant jazz figures. Only an extreme jazz-purist, surely, would object to the presence of the R & B of Big Maybelle? For the most part this is a feast both musically and visually. And so, too, are the CD and LPs – on which the sound quality is remarkably good – considering that these are live recordings made in the late 1950s. Though Christmas is receding in the rear-view mirror as I write this review, jazz lovers might like to start dropping hints for next Christmas!